Are you a recycling bin sinner? Repak has commissioned a study with Amárach Research which reveals that seven out of 10 Irish people are recycling bin ‘sinners’, disposing of incorrect and dirty household materials in their recycling bin, including nappies, razors and cigarette butts. Click here to read the Barna Recycling handy guide on what items go in each bin. Have a Green Halloween…..DIY and Win! Handy Tip : The internet has lots of great ideas for homemade costumes so get Googling. 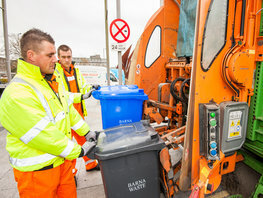 Galway City Customers : your waste will be collected on Monday 27th October as normal. Galway County Customers : if your waste collection was scheduled for Monday 27th October, your collection will now take place on Saturday 25th October instead. Roscommon Customers: your waste will be collected on Monday 27th October as normal. Leitrim Customers: if your waste collection was scheduled for Monday 27th October, your collection will now take place on Saturday 25th of October. Sligo & Mayo Customers: if your waste collection was scheduled for Monday 27th October, your collection will now take place on Saturday 25th October instead. Please remember to leave your bins out the night before your scheduled collection as collections times can take place very early in the morning. by Leitrim County Council has resulted in a shortage of physical bin tags. account to the new Pay by Weight system on the switch over date. Call us today on 1890 200 425 to get started. Please note that Monday Collections normally due on the 6th of October in Ballinasloe Town will be Collected now on Saturday the 4th of October instead due to the closure of roads during the Ballinasloe Horse Fair & Festival.